LOS ANGELES, CA, April 7, 2016 – Winners for the 7th Annual Indie Series Awards (ISA7) were revealed on Wednesday night in a star-studded ceremony held at the historic El Portal Theatre, hosted by Jen Lilley and Eric Martsolf, airing on AfterBuzz TV. Switzerland produced Arthur was named best drama series, while Keith Broke His Leg won as best comedy. In the drama acting categories, winners included Lilly Melgar (The Bay), Adam Henry Garcia (Conversations From the Afterlife), Jodie Hirst (Night School), Raymond Ablack (Teenagers), Kym Whitley (The Bay) and Kevin Spirtas (Winterthorne). EastSiders was named best drama ensemble. On the comedy side, acting winners included Melissa Archer (Viral), Keith Powell (Keith Broke His Leg), Darcie Siciliano (He's With Me), Brennan Murray (The New Adventures of Peter and Wendy), Stephen Guarino (Life's a Drag) and Cady Huffman (He's With Me). Hunting Season won as the best comedy ensemble. LARPs and Winterthorne led all series with three awards each, followed by two wins ech for The Bay, The Banks, He's With Me and Keith Broke His Leg. Lilley and Martsolf performed a song during their opening, which included a 10-person choir made up of web series producers and stars, and a electric guitar player. The ceremony also included two medleys featuring the best original nominees with performances from Colleen Zenk, Jeffrey Christopher Todd, Benjamin Scott Holst, Ron Hanks, Jillian Claire, Elisabeth Ness, Kevin Sebastian, and Patrika Darbo. Presenters at the ceremony included Kristos Andrews, Melissa Archer, Ben Baur, Daniel Betances, Jillian Clare, Tia Dae, Claire Downs, Melissa Claire Egan, Mary Beth Evans, Crista Flanagan, Jeremy Glazer, Ryan Gowland, Carolyn Hennesy, Cady Huffman, Zac Hug, Kathleen Gati, Jill Knox, Martha Madison, Keith Powell, Darcie Siciliano, Kevin Spirtas, Karrueche Tran, Ian Verdun, Sebastian La Cause, Erika Robel, Tristan Rogers, Marc Sinoway, Kit Williamson and Colleen Zenk. In all, there are 56 Nominated Series from around the globe: United States, Canada, United Kingdom, France, Switzerland, Norway and Singapore. 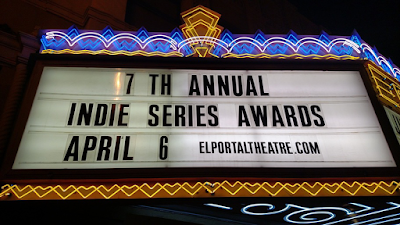 22 series took home at least 1 award during the ceremony.